I’m really loving losing weight by going 90% gluten free… without a lick of exercise. BUT, I wouldn’t want to have to cook a gluten free Thanksgiving dinner. I gave up most of the gluten when I returned from my trip to Alaska in September. I’m not allergic, but having the weight fall off and eating less white flour and sugar could only be a good thing. BUT, when it came to my Thanksgiving dinner I knew I had to make our family’s gluten-filled favorites under penalty of death. BUT, I decided to try a gluten free stuffing in addition to my Mushroom because I had a cured meat tray from Costco to get rid of. POTATOES often find their way onto Thanksgiving menus, but I’m not a mashed tater fan so I decided they would do nicely as the base of my stuffing. I didn’t find a lot of recipes for potato stuffing that did not have bread as an ingredient. Talk about carb overkill! So I made up this one. My idea was to roast potatoes and roast shallots, then mix them with spinach and crisped cured meats aka meat chips and beaten eggs. I would have added cheese if I had not already made mac n cheese for Thanksgiving. 1/2 pound of cured meat like salami, prosciutto, capocollo, etc. Instructions: Preheat oven to 350 degrees. 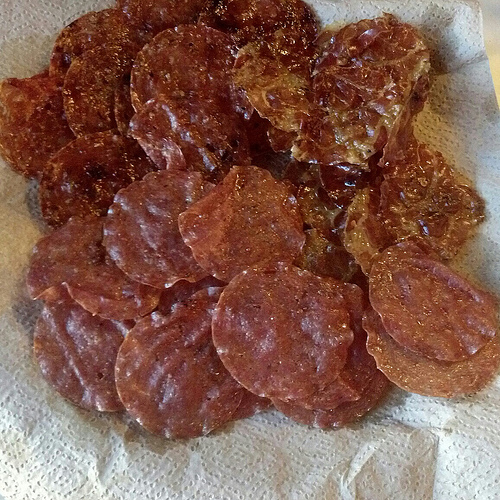 Crisp cured meat by baking it off on a sheet pan until fat releases, then cool it before you take it off the tray. Reserve fat on the sheet pan for potatoes. The “meat chips” are fun! Trim the tops and bottoms of the shallots, cost them in olive oil and roast them in their skins. Cool. Then remove the shallots from their skins and chop coarsely. Cut the potatoes in chunks and roast them on the same sheet pan in the reserved meat fat (you can add extra olive oil, if you need more). Cook celery, onions and garlic a couple of tablespoons of olive oil. Mix with roasted potatoes, shallots, spinach, stock and eggs. Mash it up slightly to incorporate the eggs. Crumble half the crisped meat into the stuffing and mix it through. Season with kosher salt and freshly ground pepper. Grease a baking pan and mound stuffing into it. Cover mound with remaining crumbled meat. Sprinkle cheese on if you are using it. Bake until browned about 30 minutes.